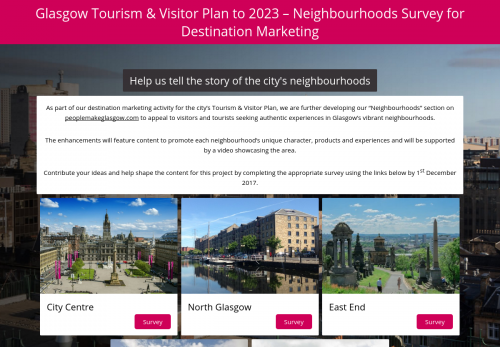 As part of our destination marketing activity for the city’s Tourism & Visitor Plan, we are further developing our “Neighbourhoods” section on peoplemakeglasgow.com to appeal to visitors and tourists seeking authentic experiences in Glasgow’s vibrant neighbourhoods. The enhancements will feature content to promote each neighbourhood’s unique character, products and experiences and will be supported by a video showcasing the area. Contribute your ideas and help shape the content for this project by completing the appropriate survey using the links below by 1st December 2017.